Hackers embarked on a strange voyage this year, beginning with spectacular, chaotic success, and ending with a whimper. We saw Anonymous nosedive from the most feared hacking force in the world to disorganized bench warmers. The dizzying highs, the stupid lows: here are 2012's greatest hacking hits. Our dear Anonymous. It's sort of hard to remember that you used to be this powerful. After Megaupload was abruptly shuttered by a joint US/New Zealand raid, Anonymous went absolutely crazy: the FBI, US Department of Justice, RIAA, MPAA, and Universal Music were all knocked offline in one massive, coordinated attack. This is how you start a new year: probably the largest single DDoS strike in the collective's history. And for Anon, it was all downhill from here. Just days after the Megaupload blitzkrieg, Anonymous had another high profile attack, and another muscular show of force: it deleted CBS.com, in its entirety. Gone. Universal Music also got the DDoS boot, for no particular reason. What's better than evading the cops? Infiltrating their "secret" international voice chat, recording it, and leaking it for the entire Internet to enjoy. Anonymous did just that, spreading a Skype chat between US and Scotland Yard detectives, and showing the world that the recent mega-attacks weren't making them cautious. It also made the cops look like fools. What does Anonymous love more than that? Maybe nothing. Anon took issue with the military-friendly law practice of Puckett & Faraj, which was defending a US Marine implicated in the highly-controversial killing of Iraqi civilians. So Anonymous ripped the firm's website apart, leaking a trove of sensitive emails related to the case, and effectively putting the entire operation out of business. The firm no longer appears to exist in any form, online or off. Here's where things started to go downhill for the DDoS boy scouts: Anonymous claimed to take down the CIA's website, then denied it did, and then apologized to the CIA. It's still unclear if Anon (or anyone) properly disabled the site. But the episode showed hints of what became a glaring truth: Anonymous was unraveling, speaking from eight different directions out of the same mouth. What in February looked like a strange moment of weakness soon became the status quo. The biggest hacking story of the year, perhaps tech history's hugest moments of back-stabbery, and the end of Anonymous as we knew it. 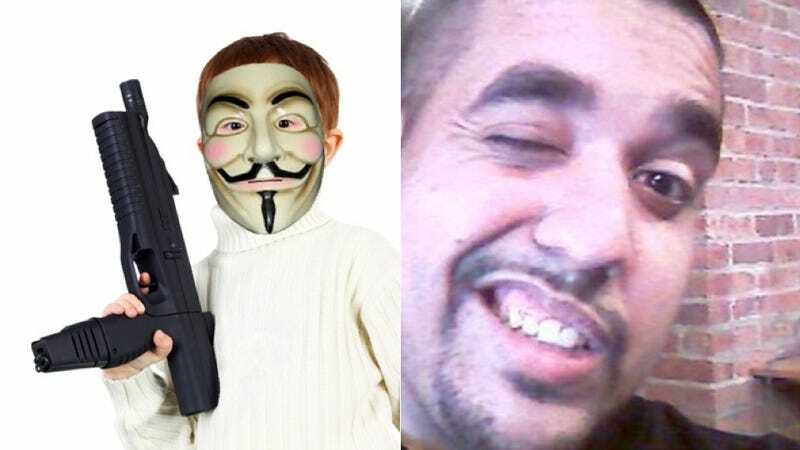 In a Shakespearean twist, the head of LulzSec, the elite wing of Anonymous, turned federal informant and sold out his entire crew. They were all arrested. It turned out Sabu wasn't just a snitch, but had been working with the FBI all along, turning Anonymous into an Internet sting operation. The legion was crippled, humiliated, and scattered. All of Anonymous' top talent was now completely out of commission, and whatever remains is still too scared to surface. Some lighthearted fun! Hollywood hackers stormed the phones of two movie stars, and we gawked. Not every online attack is about anarchy. The latest in the Stuxnet lineage swept across the Middle East, disabling computers as it hopped. Almost certainly the work of the US (and probably Israel, too). Over the summer, hackers dumped over six million passwords belonging to networking fiends at LinkedIn. Among them, "bigpenis" and "ihatemyself." Gizmodo alum and Wired writer Mat Honan was hacked to Pluto and back through some shoddy security practices at Apple. His laptop was nuked, his phone was erased, and he lost hundreds of irreplaceable photos of his daughter. Even Gizmodo's Twitter account was compromised, showing the sorry (and startling) state of passwords today. If you have to have one, make sure it's complex. Please. Cosmo the God, who ran a little band of hacker rogues called UGNazi, won't touch the Internet until he's 21, after being tied to a huge credit card fraud attack. We'll see if he makes it that far. More crime and punishment. Hacker and security activist Weev was convicted of crimes stemming from his 2010 leak of 114,000 iPad owners' personal information. He's appealing, but will almost certainly serve some time. Oh, right, Anonymous is still around. The group proclaimed itself Internet saviors of Palestine and tried to tear apart Israel via Internet. All it managed to do was deface some small businesses and DDoS minor governmental websites. A lot changes in a year.